The Sienna, Conservatory and Killian benches offer new options in seating from Keystone Ridge Designs. The Sienna bench creates a presence that is both classic and contemporary with a design that will accentuate an extensive array of landscapes and architectural styles. A historic building with distinctive window frames inspired the prominent shapes that come together to form the back design of the Conservatory bench, pictured here. The Killian bench offers an interlacing dimensional pattern that forms an alluring atmosphere of creativity, character and charm. Each new piece continues to uphold the same high standards of quality and the advanced welding and finishing techniques that define Keystone Ridge Design products. FabriTec Structures recently premiered this beautiful, custom, spiral fabric structure aboard a Royal Caribbean cruise liner. The ship's operators needed an iconic focal point and shade protection over the main deck spa and Jacuzzi area. The structure utilizes the heat-resistant Ferrari Soltis mesh fabric and spans 60 feet wide, 20 feet deep and peaks at a height of 15 feet. With virtually unlimited design options, FabriTec provides imagination and innovation in fabric architecture. Gerber Manufacturing Ltd. Introduced this 4-foot maintenance-free picnic table. The steel frame is of welded construction, hot-dipped galvanized after fabrication. The tops and seats are made from high-density polyethylene recycled plastic bottles. Color is molded throughout the material. This picnic table never needs repainting. There is no chance of slivers. Several colors are available, with stainless steel hardware. The picnic table weathers very well in extreme temperatures. 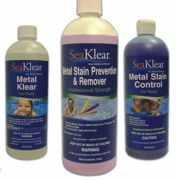 SeaKlear® introduced a complete new category into its offering of water treatment products—metal and mineral stain removal and prevention. The three primary new products are Metal Klear, Metal Stain Control and professional-strength Stain Prevention & Remover. Metal Klear prevents metal staining and helps clear discolored water caused by high metals, making it ideal for salt-system pools. Metal Stain Control prevents metals from staining surfaces, and the Stain Prevention & Remover offers professional-strength stain removal from iron, copper and other metals—even preventing further stains from occurring. Ideal for commercial aquatic facilities with serious staining problems. Air-O-Lator Corp. announced the Legacy floating 1/2-horsepower fountain to the Font'N-Aire product line. The Legacy is designed for use in ponds or lakes that do not require large spray performance due to pond dimensional restrictions. The Legacy is a packaged fountain (no alterations, please). The fountain is provided in 115-volt power only, is supplied with an ELCI (equipment leakage current interrupter) for electrical safety, a time clock and is supplied with 50 feet of power cord. The Legacy also has available, as an option, a three-light, 12-volt lighting package that includes a transformer with timer/photo cell. Colored bulbs available on request. The Recumbent Aqua Bike (patented) with adjustable resistance for exercise, rehabilitation and therapy has been designed for your ease to get seated and has a safety belt. Made of stainless steel with a plastic seat, it is rust-resistant. It weighs 50 pounds, making it easy for two people to get it in and out of the pool. The seat is adjustable for various heights and movable forward and backward, and up and down. The Recumbent Aqua Bike is an effective rehabilitation piece of equipment for individuals to strengthen the leg joints and muscles, to relearn motor skills from strokes, to recover from hip or knee surgery or to enhance your cardio workout. ACU-TROL, a division of Pentair Pool & Spa, introduced its new Smart pHTM controller—a water quality management system designed specifically to reduce chlorine usage. The new Smart pHTM continuously measures pool and spa water pH and adjusts chemistry to avoid the highs and lows that cause annoying eye irritation and cloudy water. The Smart pHTM will actually reduce the chlorine sanitation consumption required to keep the water in balance, and it will protect the pump from unnecessary corrosion caused by the fumes of out-of-balance water chemistry. Air Structures American Technologies Inc. has been a pioneer in the air-supported structure industry for more than 45 years of worldwide proven performance. Provides designs, engineering, manufacturing and installation of custom air structures for all multi-sports arenas, including Hononegah in Rockton, Ill.; Rutgers University; Texas Tech. ; Healthquest Baseball Dome in Flemington, N.J.; Hampshire Hills; indoor golf, such as Turning Stone Golf Dome in Syracuse, N.Y.; and Tonawanda Golf Dome in N.Y.; and the NFL training facilities of the Miami Dolphins, New York Jets and New York Giants. Thermaliner with R-12 value or higher when required. The only BOCA evaluated and recommended for large clear-span structures.